In this extraordinary and wonderful one-man play Gareth (John) Bale shows us he has as masterly a grasp of the art of theatre as his namesake, Gareth Bale, has of the art of international football. He moves us to real tears at some very tender moments and has our hearts pounding with the thrill of the game. For many years rugby was a way of life for Ray Gravell. 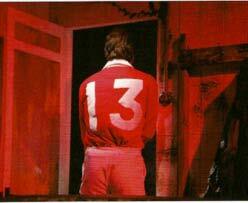 The stage is an old decaying 1970s rugby changing room; Francis Bradshaw’s set gives us the perfect atmosphere. Grav enters, uncertainly at first. The light is low as he tries to get his bearing. His first word, Mam! He finds himself by quietly listing his major rugby achievements, Llanelli, 23 Caps, British Lions, Barbarians, LLa… he talks of lying in bed as a child and of his romantic imaginings. We are drawn into his story by the poetic and poignant words of writer Owen Thomas. Bale sends real pictures right into our minds. Throughout the whole of his remarkable performance, though it is much more than a performance, we don’t see an actor talking, we see everything he tells in real strongly drawn pictures, it’s almost like being in the cinema. And for those of us not able to get to the Arms Park the rugby roars out at us through the television sets in our heads. We skip over the rugby years, just for a moment, Grav has become an actor. The film is Rebecca’s Daughters. He’s very nervous, he’s to join Peter O’Toole in the make-up wagon. Both writer Thomas and Bale’s Grav move into their high comedy gear that gets us laughing out loud many times throughout the evening. Dad was out hunting on the mountain, he loved to hunt, out on the mountain with his gun and his dog. It’s very late and he hasn’t returned. Anther film starts to roll in our heads, Grav goes out into the dark night to search for his father. We see him cracking through the gorse and we smell the dank air. The dog finds him and leads Grav to the sight of his dad, lying in the wet fern; he’d killed himself with his own gun. LLanelli is a small town just west of Swansea. Some may tell you Rugby was invented there. It has been a production line for international rugby stars since the beginning of the twentieth century and Ray Gravell was one of their greatest. Positioned at centre, he played a hard game. “get your first tackle in early, even if it's late." He talks of his great playing days with great enthusiasm and humour. He was a great joker in the team and tells of the time Gareth Edwards (Another great rugby legend) turned the tables on him. These men may have been some of the best rugby players the world has known but they also knew how to enjoy themselves. Thomas’ brush strokes with words and Bale’s endearing and totally captivating delivery of them sometimes go at the speed of a flaker racing towards the line and we all join in the cheer at his touch down. We are taken through his rise to the top of his sport from his first success as a boy, claiming his place in the West Wales team. Captain of Llanelli, his twenty three caps for Wales, the Barbarians and the British Lions. We gaze with tension as Phil Bennett is about to take a kick, we breathe a sigh of relief and cheer loudly as the ball sails between the post. Yes we were there! Before we go he takes us through the Llanelli club’s finest achievement when they beat the famous All Blacks 9-3. Grav tells us how a whole chapter of his life can be summed up in these two little numbers. We all became part of that 25000 Stradey Park crowd. Ahead in the first five minutes! Phil Bennett again a big kick for touch, the referee’s whistle goes, the game is won. If you say out loud, the words 9-3 in the centre of Llanelli , you will be mobbed. Gareth Bale will most certainly be mobbed. Is it Gareth Bale? or is it Ray Gravell? For these two hours on the stage they have merged into one.